Last month, a Georgia inmate was indicted for ordering the revenge killing of a 9-month-old baby from his prison cell. His alleged tool: a cellphone. In March, prisoners at the Holman Correctional Facility in Alabama rioted, taping the uprising with smuggled phones — and posting the videos on Facebook. In January, the U.S. Department of Justice announced that more than 50 people had been charged with using contraband cellphones to run elaborate wire fraud and money laundering schemes from inside Georgia’s prisons. 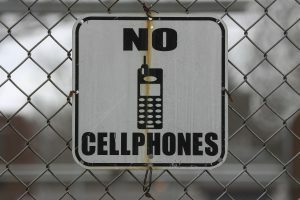 The use of contraband cellphones for illicit scams and worse inside prisons is bedeviling state correctional officials. And it has prompted 10 governors, led by Republican South Carolina Gov. Nikki Haley, to ask the Federal Communications Commission for help in cracking down on it. “It’s our No. 1 problem,” said Bryan Stirling, director of the South Carolina Department of Corrections. The governors are asking the FCC, which governs the nation’s airwaves, to give states “flexibility and authority” to take advantage of technology that makes it impossible to use cellphones from prison, including jamming cellphone frequencies — a practice that is illegal. The governors appear to have the support of at least one FCC commissioner: Ajit Pai. “In the hands of an inmate, a cellphone is a weapon,” Pai said at a Corrections Technology Association conference in May. Cellphones provide inmates with unfettered access to the outside world and the tools to engage in all types of criminal activity with speed and efficiency, prison officials say. They’ve been used to intimidate witnesses, order hits on a prosecutor’s family member, coordinate escapes, bribe prison officers, orchestrate gang activity, extort money from family members, defraud the elderly and run nationwide drug rings. In 2010, a South Carolina prison official in charge of investigating contraband cellphones was gunned down after prison inmates orchestrated an assassination attempt through cellphones. He survived six gunshots to the chest and stomach — barely. There’s little national data on the scope and extent of the problem, but corrections officials report that contraband cellphones are on the rise. Prison officials in South Carolina, for example, confiscated 3,037 cellphones and accessories in 2014, according to Stirling; last year, they confiscated 4,107. When it comes to smuggling cellphones, inmates get creative, prison officials say. Sometimes they bribe correction officers. Sometimes they use drones to fly over prison walls, or smuggle them in through food delivery trucks, or in underwear or legal papers. Some use accomplices to shoot them into prison yards using “potato guns” made out of PVC piping. Or they just enlist help in “throw overs”– getting a friend to toss them over prison fences. In Georgia, prison officials confiscated cellphone parts that had been thrown over the fence — stuffed in the body of a dead cat. David Fathi, director of the ACLU National Prison Project, said that prisons have a legitimate security reason to ban prisoners from having cellphones. “But prisons themselves help create the demand for contraband by making it very difficult and expensive for prisoners to call their loved ones through legitimate channels,” he said. States are combatting contraband cellphones in a number of ways, from old-fashioned searches and beefed up security at the front gates to body scanners. Prison officials also use a “B.O.S.S. chair,” or body orifice security scanner, which detects when prisoners have metal hidden on their body. And these days, prison officials find themselves monitoring the air. In South Carolina, Haley allocated $10 million so that prisons could build towers around the perimeters and buy cameras and metal detectors, the better to keep an eye out for contraband. In Mississippi, where prison officials confiscated over 3,000 cellphones last year, the state uses body scanner equipment and dogs trained to detect cellphones. California also uses K-9 units. Several states, including California, Maryland, Mississippi and Texas, have started using an “inmate call capture” system. It picks up calls made from within the prison and passes along only authorized calls, by someone such as a corrections officer. If a cellphone number is on an approved list, the call goes through. If the number is not on the list, it doesn’t. Alabama has considered using the system, but decided the cost — roughly $1 million per unit — was too high, said Alabama Commissioner Jefferson Dunn. In 2013, the FCC proposed streamlining the regulatory review process so that prison officials could quickly take advantage of innovations such as the call capture technology. The FCC also proposed making it easier for cellphone providers and prison officials to identify and deactivate contraband phones. But the commission has yet to act on the proposals. If the 10 governors get their way, the FCC would allow them to jam calls and render inmates’ cellphones useless. Jamming works like this: A device is used to transmit the same radio frequencies as cellphones, disrupting communication between phones and the cellphone tower. But under a 1934 federal law, it’s illegal for states and local agencies to interrupt radio airwaves. The FCC has so far said that jamming technology causes more problems than it solves, such as interfering with 911 calls or other emergency services. And the cellphone industry strenuously opposes jamming. For prisons and jails located within an urban area, such as the Baltimore City Detention Center, located “within yards of an interstate” highway, jamming phones poses serious problems, said Brian Josef of the CTIA, the association that represents the nation’s wireless industry. “Radio frequency waves don’t neatly stop at a corrections facility fence,” Josef said. But some prison officials, such as Alabama’s Dunn, say that because most prisons are located in remote rural areas, other calls wouldn’t be compromised by the jamming. “It’s a tool that we out to at least be able to explore. I think the rewards potentially outweigh the risks,” Dunn said.